Nazca Booby in San Diego waters? 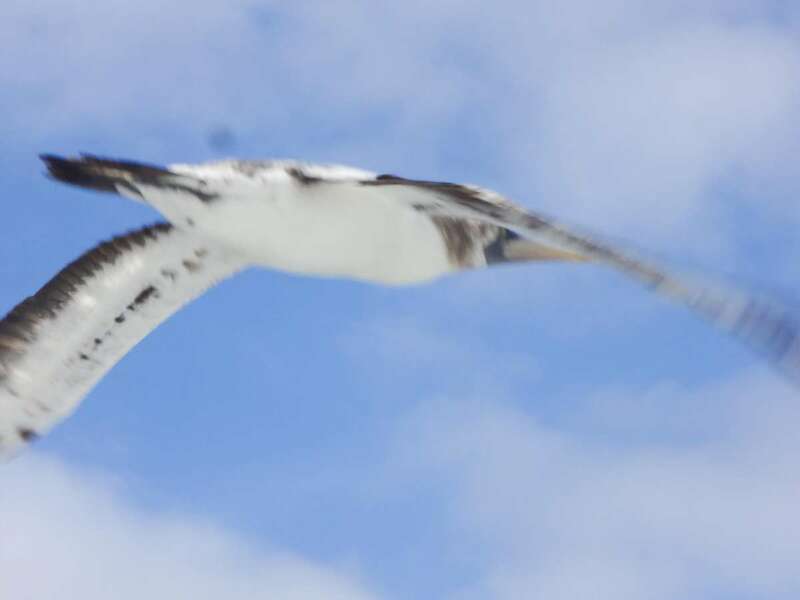 [All photographs copyright, Scottie Schmidt 2015] Local marine mammal observer Scottie Schmidt snapped these incredible photographs of a Masked/Nazca Booby on board the Hornblower whale watching tour out of San Diego on 01 September 2015. The Hornblower, performing a four hour tourist nature tour, stays in US waters just outside of Point Loma where it looks for whales and dolphin. 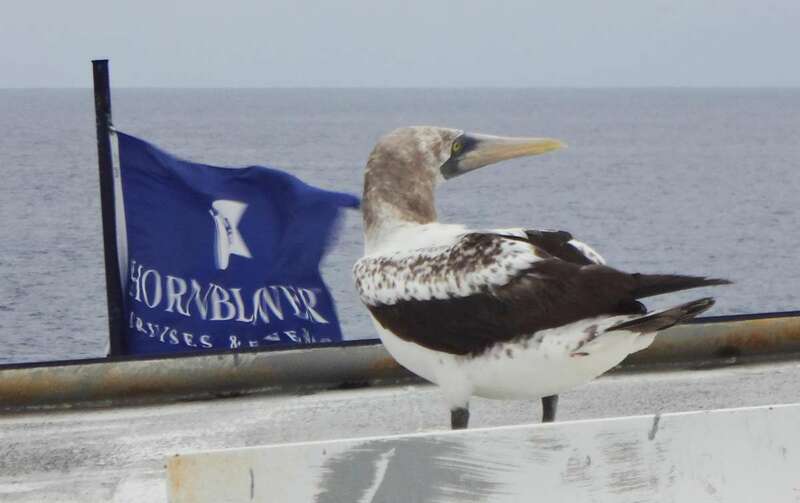 Scottie noted that he has been on hundreds of these trips aboard the Hornblower but this was the first time a booby had actually landed on the vessel! 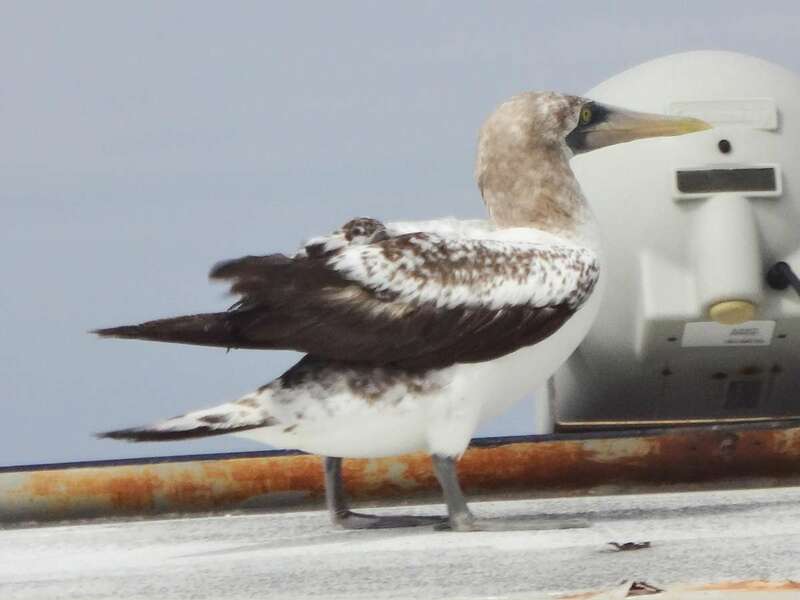 I think characters of this 2nd-cycle booby lean towards identification as a Nazca Booby rather than a Masked Booby. 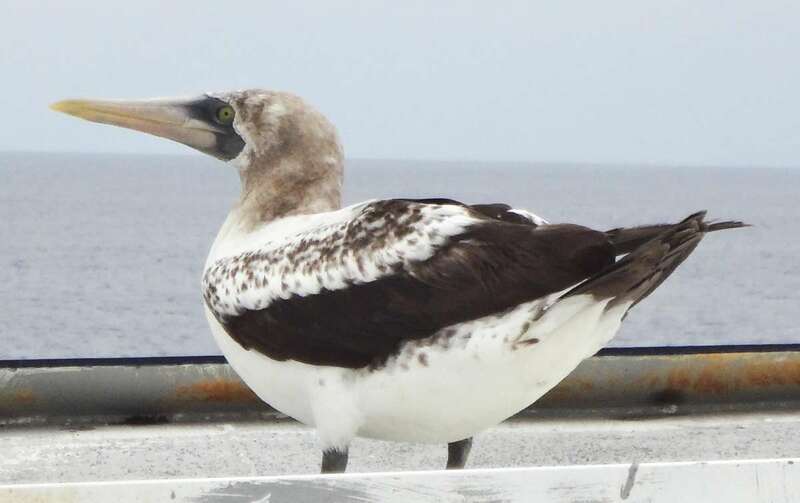 The bill color, pale lavender at the base changing to pinkish throughout the length and then yellow-orange at the tip, is basically a duller version of adult Nazca Booby. 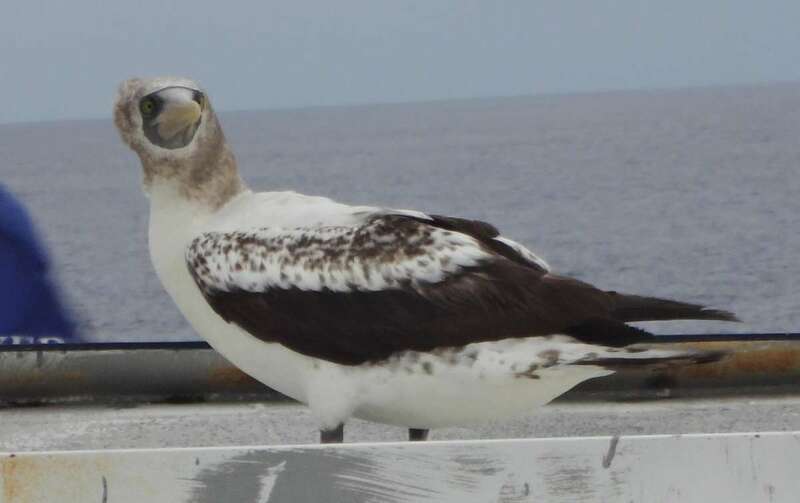 Masked Booby should be yellowish-green changing to yellow at this age. Also the bill shape, more concave and finely shaped, seems to fit Nazca better compared to the swollen more massive bill shape characteristic of Masked. Other plumage characters might be supportive also, the white basal coloration of the central rectrices appears to extend quite far down those feathers, and the dark plumage looks more chocolate-brown than blackish-brown. Both characteristics better for Nazca compared to Masked. Scottie Schmidt first sent these photographs over to Stan Walens who distributed them to local San Diego seabird enthusiasts for further discussion. The photographs were also examined by Alvaro Jaramillo. This is incredible! Wish I’d been there. I once saw a Masked Booby on the Coronado Islands several years ago, but have not even heard of the Nazca Booby. 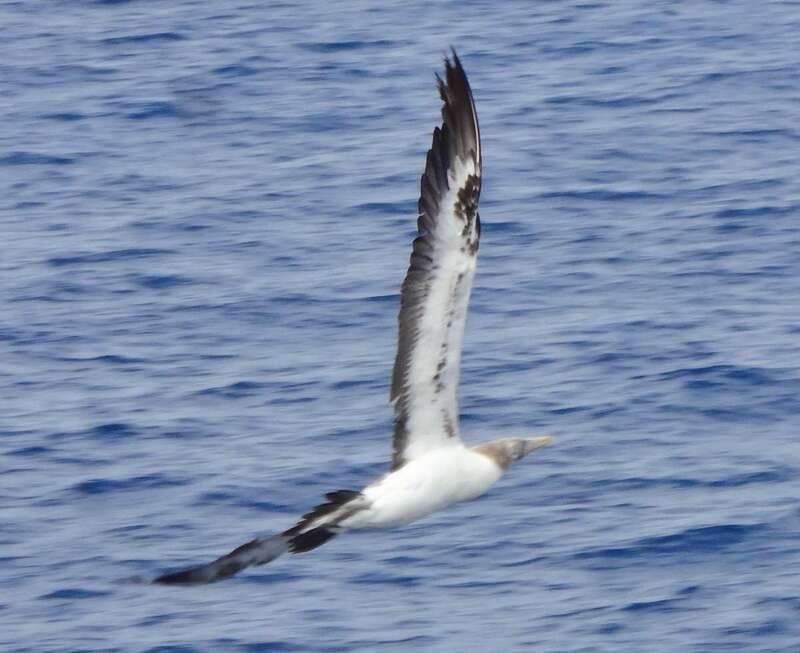 So exciting to see this rare bird on Hornblower’s Blue Whale watching cruise! I have no opinion as to the identification of this bird beyond Masked/Nazca. However, might not the purportedly “more concave and finely shaped” bill of this bird versus what you describe as the “swollen more massive bill shape characteristic of Masked” be as likely a consequence of sexual dimorphism as it is indicative of a specific difference? I see in Pyle (2008) that females average deeper bills (and smaller size) than males, and can often be sexed on that basis when looking at mated pairs. Looking at online photos of presumed pairs, I could just as easily apply your description of a “finely shaped” bill to what I suspect is a male Masked, or a “massive” bill to what I suspect is a female Nazca. As for perceived differences in wing color, doesn’t it appear that the older, more worn feathers are those that look more chocolate-brown while the more recently molted distal feathers are more blackish brown? enjoy yourself, and show your Interesting finds to all! Thanks and keep life fun, adventuresome, and interesting for yourself to share with others. I just posted a bunch of photos of Masked and Nazca boobies from farther south on Facebook. In any case, I do think we have learned a bunch in the last while on these boobies. This individual I now think is categorically a Nazca. Particularly, the white on the tail is significant. Bill color is right on as well.